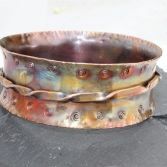 This lovely Painted with fire Copper Spinner Bangle is made solid Copper which has been hammered textured cleaned and given a high polish, i then run a gas touch flame carefully over the copper to create this lovely colours. The Bangle is then sealed using Renaissance Wax. 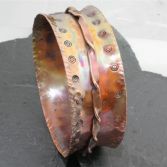 At the centre of the bangle is a twisted copper band which moves freely around the bangle to add detail and interest. The bangles band measures 23mm wide and the inside diameter measures 6.5cm which is an average size medium. You will receive the bangle shown in the images. After a period of time some colour changes will occur. Other sizes can be made to order please email me at julie@juliebrandonjewellery.co.uk. 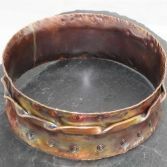 The Bangle is handcrafted by me and can be made to order, however no two would be the exactly same due to the handmade nature of the Bangle. 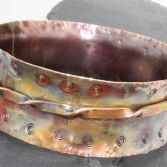 However the image shown is a good representation of the Bangle you would receive if a different size was ordered. 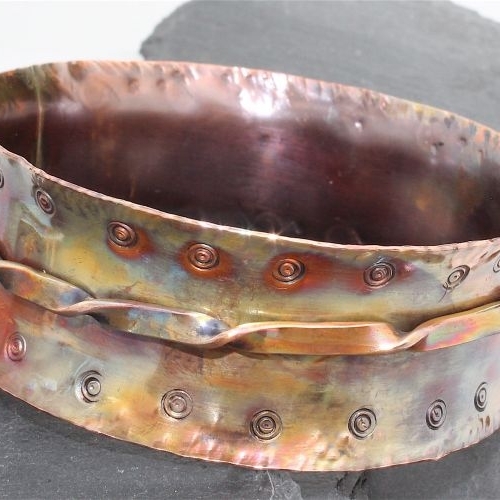 To keep your bangle looking highly polished i recommend polishing it from time to time with a silver polishing cloth which works great on Copper also. The Bangle has an anti-clastic curve so is very comfortable to get on and off the wrist and to wear.